The video installation Portrait of Carlotta functions as a cinematic remnant of Alfred Hitchcock’s film Vertigo; examining our obsession with images and the desire to possess them. The painting’s subject, Carlotta, has been digitally removed revealing a landscape in slow animation. The distant clouds change in the afternoon light, a pool of water ripples in the wind, a bird flies overhead as the background quietly awaits its sitter. 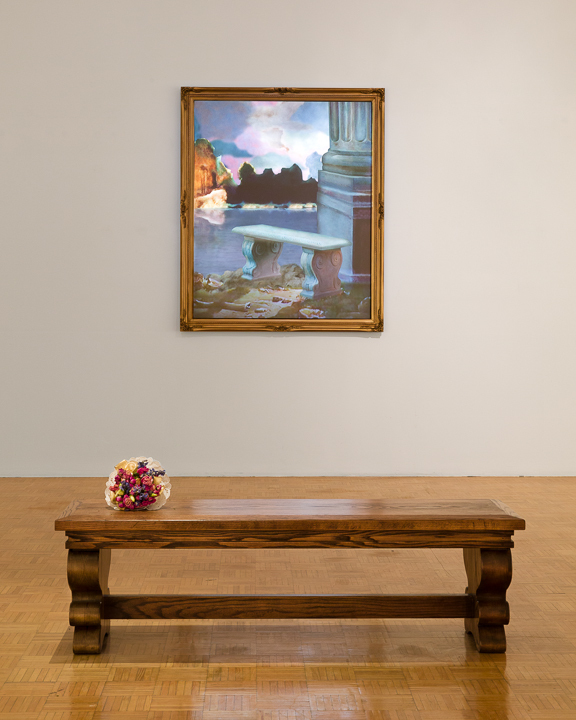 A reproduction of the film’s museum bench occupies the space in front of the moving painting, on top rests Carlotta’s bouquet, and the original musical score is audible from within the bench. *This work was first exhibited as part of the Madeleine exhibition.